This research is going to explain the fast neutrons and gamma radiation registration by the new inorganic single crystals of the KDP (Potassium Dihydrogen Phosphat) group that was grown from the water solutions and activated by the thallium Tl+ or cerium Ce3+. The appearance of the luminescence upon KDP:Tl crystals irradiation with the fast neutrons is explained by secondary ionizing radiation (recoil protons and oxygen recoil nuclei) with excitation of the activator under ionization losses for inhibition. Also the recombination mechanism with the radiation defects of the hydrogen sublattice going to transmit electron excitations to the region of the Tl+ luminescence center. In the KDP:Ce crystals the excitation mechanism of the activator has a similar character, but the luminescence itself is due to the 5d ® 4f transition in Ce3+ ions. The detection efficiency for activated KDP:Tl and KDP:Ce crystals to the fast neutrons in comparisons with organic (plastic) scintillators were calculated theoretically and experimentally. For the crystal volume about 10x10x10 mm3 with the optimal activator concentration the fast neutron detection efficiency under irradiation of 239Pu-Be is 12% for KDP:Tl and 16% for KDP:Ce, which is in a consistent with the theoretical calculation and is not lower according to the parameters of typical organic scintillators. A high natural selectivity of the KDP scintillators to the fast neutrons due to their low sensitivity to gamma radiation was detected. Herewith the internal discrimination of n/γ signals (the ratio of detection efficiencies for the fast neutrons and gamma quants) for activated KDP crystals is 7-8 times higher than of regular plastic scintillators. Marion J.B., Fowler J.L. Fast Neutron Physics. Part 1: Techniques, Part 2: Experiments and Theory. - New York, 1960. Harvey J.A., Hill N.W. Scintillation detectors for fast neutron physics // Nuclear Instruments and Methods. – 1979. - Vol. 162. - P. 507-530. Klein H., Brooks F.D. Scintillation detectors for fast neutrons // Proc. of Sciences, Int. Workshop on Fast Neutron Detectors and Applications (FNDA 2006), University of Cape Town, South Africa, (April 3-6, 2006), Vol. PoS(FNDA2006)097. - P. 1-24. Kouzes R.T., Lintereur A.T., Siciliano E.R. Progress in alternative neutron detection to address the helium-3 shortage // Nuclear Instruments and Methods in Physics Research, Section A. - 2015. - Vol. A784. - P. 172-175. Ryzhikov V.D., Naydenov S.V., Piven L.A., Onyshchenko G.M., Smith C.F., Pochet T. Fast neutron detectors and portal monitors based on solid-state heavy-oxide scintillators // Radiation Measurements. – 2017. -Vol. 105. - P. 17-25. Beckurts K-H., Wirtz K. Neutron Physics. – Berlin: Springer-Verlag, 1964. Birks J.B. The theory and practice of scintillation counting. - London: Pergamon Press, 1964. Knoll G.F. Radiation detection and measurement, - 4th Ed. - Wiley, 2010. Hull G., Zaitseva N., Cherepy N., Newby J. et al. New organic crystals for pulse shape discrimination // IEEE Trans. Nucl. Sci. – 2009. - Vol. 56. - P. 899-903. Favalli A., Iliev M., Chung K., Hurlbut C. et al. Pulse shape discrimination properties of neutron-sensitive organic scintillators // IEEE Trans. Nucl. Sci. – 2013. - Vol. 60. - P. 1053-1056. Voronov A., Salo V., Puzikov V., Tkachenko V., Vydai Yu. Potassium and ammonium dihydrogen phosphates activated with thallium: growth and luminescence and scintillation properties // Crystallography Reports. – 2006. - Vol. 51. - P. 696-701. Voronov A.P., Vyday Y.T., Salo V.I., Puzikov V.M., Bondarenko S.I. Influence of thallium doping on scintillation characteristics of mixed KDP/ADP crystals // Radiation Measurements. – 2007. - Vol. 42 (4). - P. 553-556. Voronov A.P., Babenko G.N., Puzikov V.M., Roshal A.D., Salo V.I. Doping of KDP single crystals with Cerium: growth and optical properties // Crystallography Reports. – 2008. - Vol. 53. – No. 4. - P. 708-712. Voronov A.P., Babenko G.N., Glushkova L.V., Puzikov V.M., Roshal A.D., Salo V.I. Potassium dihydrogen phosphate doped organic complexes of rare earth elements // Inorganic Materials. – 2009. - Vol. 45. - P. 533-537. Zaitseva N., Carman L. Rapid growth of KDP-type crystals. Progress in crystal growth and characterization of materials. – Pergammon, 2001. - P. 1-118. Kolybayeva M., Pritula I., Salo V., Garnov S. Effect of radiation on the properties of water soluble crystals // Proc. SPIE 3244, Laser-Induced Damage in Optical Materials, 1997 (20 April 1998). - P. 130. Sugimotoy H., Ikeda S.J. Proton transfer in hydrogen-bonded crystalline KH2PO4 // J. Phys. : Condens. Matter. – 1996. - Vol. 8. - P. 603-618. Zazubovich S., Voloshinovskii A., Stryganyuk G. Luminescence of CsCl: Tl crystal under synchrotron excitation // Physica Status Solidi. – 2002. - Vol. 233. - No. 2. - P. 238. Fujita I. Optical-absorption studies on noncubic s2 centers in single crystals of KH2PO4 and RbH2PO4 // Physical Review B. – 1994. - Vol. 49. – P. 6462-6469. 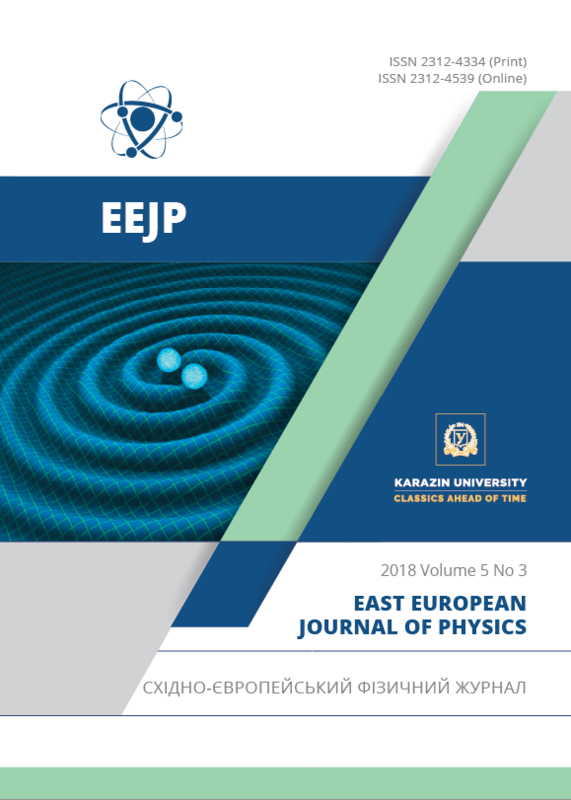 Ogorodnikov I., Pustovarov V. Electronic excitation energy transfer and nonstationary processes in KH2PO4:Tl crystals // J. Exp. Theor. Phys. - 2017. - Vol. 124. - P. 592-603. Ogorodnikov I., Kirm M., Pustovarov V., Cheremnykh V. Low-temperature time-resolved vacuum ultraviolet spectroscopy of self-trapped excitons in KH2PO4 crystals // Optics and Spectroscopy. - 2003. - Vol. 95. – P. 385-389. Ogorodnikov I., Kirm M., Pustovarov V. Luminescence of the hydrogen bonded crystals // Radiation Measurements. – 2007. - Vol. 42. - P. 746-750. The JENDL (Japanese Evaluated Nuclear Data Library), Japan Atomic Energy Agency (JAEA); http://wwwndc.jaea.go.jp/jendl/j40/j40.html. Kouzes R.T., Ely J.R., Lintereur A.T., Stephens D.L. Neutron detector gamma insensitivity criteria, Technical report PNNL-18903. - Pacific Northwest National Laboratory, Richland, WA, USA, 2009.